The name Gamalama Mountain is taken from the word Kie Gam Lamo (“big country”). 1775, the eruption of Mount Gamalama obliterated Soela Takomi Village with 141 people. After the eruption, at a village location 18 kilometers from the center of Ternate City, two lakes appeared, namely Tolire Jaha Lake and the litle Tolire Lake. Gamalama has erupted more than 60 times, the eruption was first recorded in 1538. The last eruption of Mount Gamalama occurred in 2003. Gamalama does not show active symptoms. But starting in 2009, Gamalama again showed activity so that the status “Waspada” was applied to the mountain because of increased mountain activity. The “Alert” status is the third level in the alertness of active volcanoes. On Monday, December 5, 2011 there was a burst of volcanic ash from Mount Gamalama at 00.08 which shows that Mount Gamalama is still active. Mount Gamalama erupted and prompted thousands of residents to flee because of bursts of ash and dust particles as high as 2,000 meters into the air which spewed it into a city near the mountain. This causes Gamalama’s alert status to rise to the third level, “Alert”. 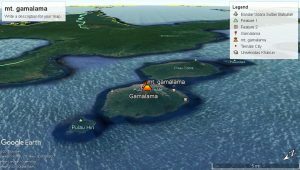 Gamalama is one of the active volcanoes located in the arc of Halmahera Island, northeast of Maluku. This region is estimated as a meeting area of ​​several plates including the Pacific Plate, Eurasia, and Australia and other small plates. Ternate Island which was formed by Mount Gamalama took place above the subduction zone which tilted east with a small angle. Gamalama Tua, the rest is found in the southeast and south. The peak extends from the northeast to the southwest and is known as Melayu hill or Mount Kekau. Gamalama Adults whose body remains take place in the western part of Ternate Island. Its peak stretches from west to east and is known as the Keramat or Medina hill.